Motorcycle Club Four wheels move the body. Two wheels move the soul. After an absence of almost forty years, the most monstrous, powerful, and imposing Ducati ever built, the massive Apollo cruiser, returned home to the Borgo Panigale factory in 2002. Originally constructed as a police bike for the American market, the Apollo proved the "Spruce Goose" of Ducatis, far too heavy for the tires and the engine output of the day, and as a result only two were ever produced. On hand for the reception of this last surviving Apollo was a visibly excited Livio Lodi, then Assistant Curator of the Ducati Museum (he is the Curator today), who vowed to return the Apollo home the first time he saw it six years before. Credit also must go to Ducati Japan's General Manager of that period, Mirko Bordiga, who supervised the bike's transfer, and the gracious donation of the original Apollo's tank and rear light by Andrea Dell'Omo. The four-cylindered, 1300 cc beast, arrived on generous loan from its current home in the collection of Iroaki Iwashita in Japan, and was immediately sent down the long factory corridor to the workshop of Ducati veterans and mechanical gurus Giuliano Pedretti and Primo Forasassi for restoration to its original condition. 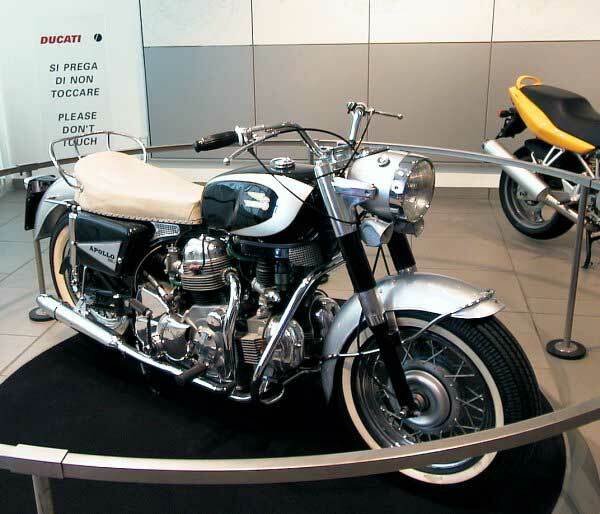 The fully restored motorbike, exactly as it appeared at the Daytona Motorcycle Fair of 1965, has been on display in the Ducati Museum between 2002 and 2003.
tunc, I don't know where you keep coming up with all the strange and different things you find, BUT, keep'em coming! Always interesting and fascinating, some educational and some just strange. Thanks for keeping things intersting. Mon Diue thats a bike! 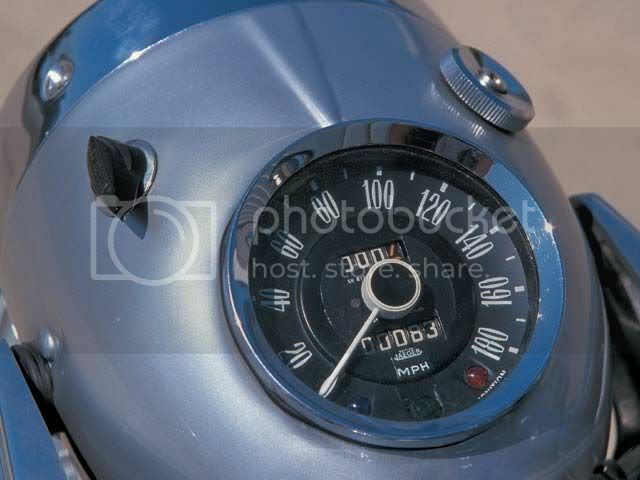 I'd love to have one just as a historical piece, and a speedo that goes to 180 MPH? it not KPH from what I can see. I also wonder if this bike did any land speed records in its day, I have an old 1976 Kawasaki Z1 900cc (Ithink thats what it is) that belongs to a co worker, he has been pestering me to restore it for him, I checked out its value and the funny thing is that it actually has a good value even if it looks like a pile of junk to me. 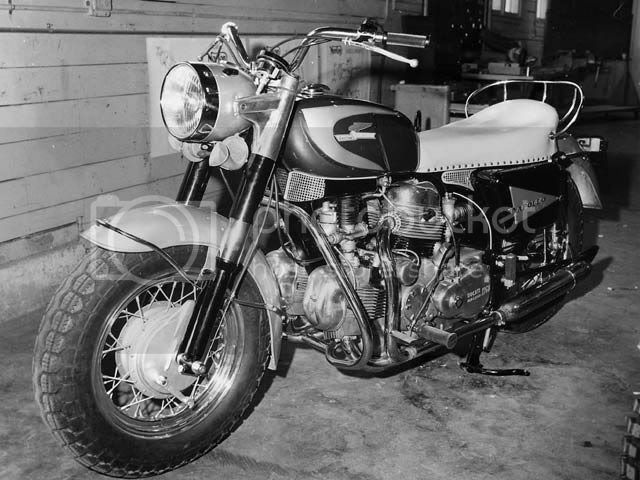 Interesting slice of motorcycle history and photos, thanks for posting. Sounds to me like the Chief is pretty smart!!! Thanks don but I might've let the cat outta the bag a bit too early. 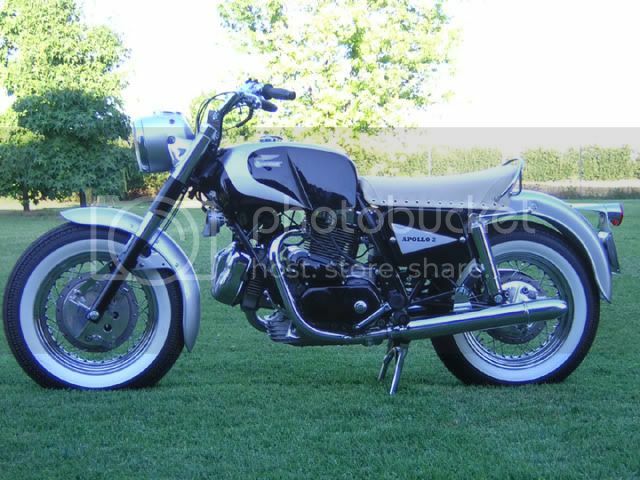 The 1964 Ducati Apollo 1264cc V-4, here is some more information. Now I am interested in learning more about Ducatis! Looks like an old flat head, 45ci maybe, but the side covers and lines don't look HD so I will say Indian. That is my dream, old HD flat head 80 in a 50's wishbone frame. Looks like an old flat head, 45ci maybe, but the side covers and lines don't look HD so I will say Indian. That is my dream, old HD flat head 80 in a 50's wishbone frame. Yes it is an Indian, just the ci was a little low. The Indian Motorcycle Company, located in Kings Mountain, North Carolina, is the oldest motorcycle company in the United States. At one time, it was also the largest motorcycle manufacturer in the world. The company’s most popular models were the Scout – a pre World War II design, and the Chief which was hugely popular from 1922 to 1953. Indian was founded in Springfield, Massachusetts in 1901. The headquarters is also stationed in Springfield. Former bicycle riders and founders of Indian Motorcycle Co George M. Hendee and Carl Oscar Hedström teamed up to make a motorcycle together. The first one had a 1.75 bhp and a single cylinder engine. Sales of these motorcycles increased in large numbers over the next decade. In 1902, the two men designed streamlined motorcycles that they set the worlds fastest motorcycle record with – 56 mph. They started selling these “Diamond Framed” motorcycles to the public. In 1904, the production of the bikes went from over 500 made per year up to a record breaking 32,000 in 1913! Indians first V-Twin motor was built in 1907 and set even more speed records. A man named Erwin “Cannonball” Baker rode from San Diego to New York in a record breaking 11 days, 12 hours and 10 minutes riding an Indian motorcycle. The Scout and Chief came out in the early 20’s, and quickly became Indians most popular models. The reputation for Indian Scouts and Chiefs was strength and reliability. 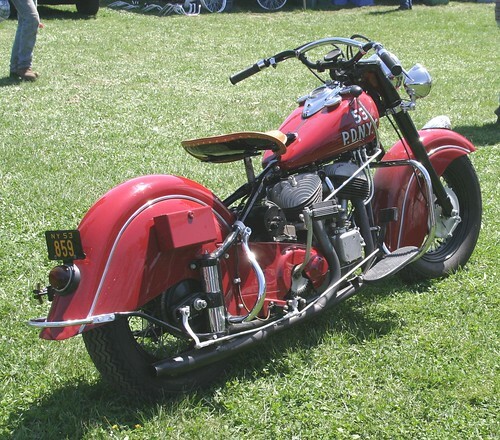 In 1930, Indian joined forces with duPont Motors. duPont stopped making their automobiles in order to concentrate on Indians. Since duPont had connections in the paint industry, Indians were available in more than 24 colors. The motorcycles made during this time, had the head-dress logo on the gas tank, which led to most of the company’s Native American themed advertising. Also, Indian and duPont manufactured bicycles, boat and aircraft engines, and air conditioners. Introduced two years after the Scout, the 1922 Chief started out with a 1000 cc, 61 cubic inch engine. However, in a later year, the Chief came equipped with a fully featured 1200 cc, 73 cubic inch engine. With a motor this big, Indian added a front brake to the Chief in 1928. Chiefs started dozens of Indian trademarks, such as large skirted fenders which made the chief visually appealing, and a sprung frame which increased smoothness while riding the motorcycle. A well tuned Chief in 1940 could reach speeds of up to 100 mph, and 85 mph stock. If not for the somewhat heavy weight of the Chief, the acceleration would have been greater. 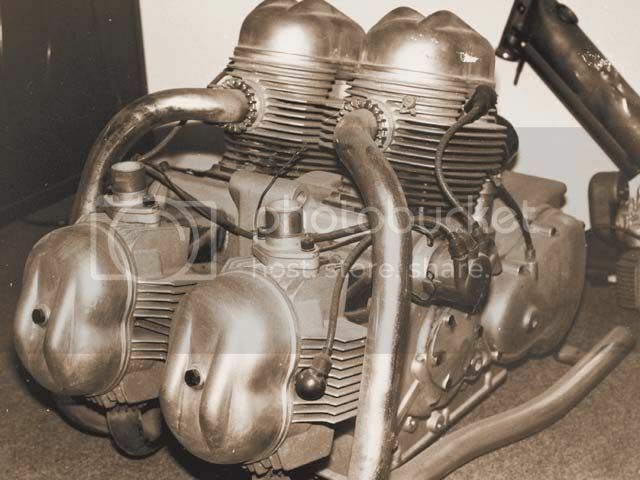 In 1950, the Chief was fitted with a whopping 1300 cc, 80 cubic inch engine for even more power. Unfortunately, these Chiefs were too expensive to build, and the Chief was discontinued in 1953. The Indian Chief was such a great historic motorcycle, that it was featured on a special edition set of United States 39-cent stamp; part of a four historic motorcycle set. A new company in 1999 began making motorcycles under the Indian name in Gilroy, California. The motorcycles were basically newer versions of the Chief and Scout, and one called the Spirit. The engines were stock S&S engines and the bikes made then are often called Gilroy Indians. After a major investor turned out in 2003, Indian wet bankrupt yet again. In July of 2006, Indian Motorcycle Company announced its new home in Kings Mountain, North Carolina. Indian is now trying to restore the old Indian Motorcycle Company to what it used to be. Focusing on quality, performance and craftsmanship, the new Chiefs are produced in small numbers. The new 2009 Chief features a new Powerplus V-Twin, 105 cubic inch engine. Everything about the new Indians is new and updated. Technology has improved so much that the motorcycles produced today are near perfection on every level. Indian plans to have 50 dealerships open across the United States by the end of 2011.